Our goal is to become the most essential TV Installation & Antenna company in the Local area by having exceptional training, helping Team-members grow personally, tried & Tested systems and by making sure our clients come first at all times. We aim to provide a service that goes above and beyond client expectation; providing these solutions in a respectful, confident manner that is worthy of recommendation to the dearest of friends & family without hesitation. 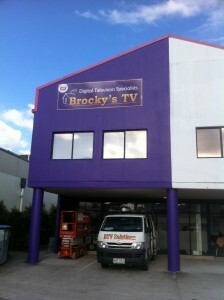 Today, Brocky’s TV is widely regarded as one of Australia’s leading providers of Residential and Commercial free-to-air installation services, audio & visual integration and home and business security products. First established on the Sunshine Coast, it has now a stable operations in South East Queensland and northern NSW, as well as providing products across Australia. The future holds many challenges for us and the industry, and the opportunities are greater for us now with newer technologies and systems influencing the way our company positions itself in the rapidly expanding marketplace. Brocky’s TV is more than capable of assisting with the Analogue Television Switch-off in the coming months and is leading the way in preparation for the switch to High-Definition Digital TV. Much of the company’s success has been built on the strengths of our people and an unwavering commitment to total customer satisfaction. We have earned the trust of our clients by listening and carefully analysing their needs and providing the best overall value when dealing with TV Reception, Installation Services, Audio and Visual integration and Home and Business Security products. Brocky’s TV provides our customers peace of mind by delivering unparalleled service and absolute confidence in the in our Australian made parts and with an exclusive extended 5-year warranty on the parts and labour. Give the Local Guy a Try! and H52/207 Brisbane Road, Labrador.